I am a seasonal-vore. I have developed an aversion for foods that are grown in the wrong conditions (i.e. greenhouse) and out of season. They never taste good, no matter what you do to them. Vegetables need earth and sun to be right. An eggplant in January? It’s like rubber foam. A tomato in March? A bag of water. And peppers? the real luscious peppers, not those winter ghosts. How long do I need to wait? I have been waiting since September! Luckily the friggitelli have just arrived. 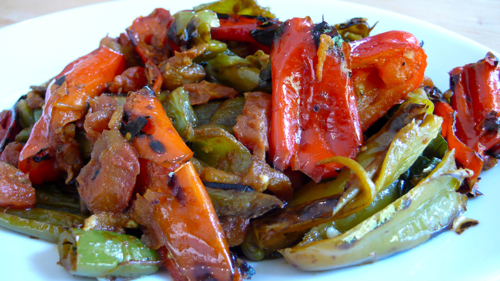 Friggitelli or friarielli are Italian frying peppers not dissimilar to Cubanelles. They are recognizable by their skinny conical shape and thin flesh. They are sweet, tender, crispy, lightly fruity. I am so happy to welcome you, little brothers. Heat heavy large skillet over medium heat, add 1 tablespoon olive oil and the peppers and cook, stirring occasionally, until lightly charred, about 5 min. Add the garlic and cook briefly until fragrant, about 1 min. Add the tomatoes, season and cook one more minute. Stir in the basil leaves, season and set aside to cool. The flavor improves after a few hours so prepare them in advance if you can and refrigerate until needed. You can use them as a side dish or re-warm them and toss with pasta, a little fresh chile pepper and a sprinkle of grated pecorino. Serve 4 as a side dish and 2-3 as a pasta sauce. Yum! I’m with you on eating vegetables seasonally. It makes all the difference. And if you can grow them yourself, well, you’re in heaven! you are so right, I wish I could grow peppers, it’s too cold here. Luckily I have a farmer down the road where I can buy them freshly picked! I can’t wait to try these! Can you make these without the tomatoes? Absolutely stunning. I do this all of the time – well, every fall. We have an incredible Italian store that imports from all over. I am a use local gal, but we don’t grow local peppers unless in greenhouses here – so that is a God send. I roast cases each fall, and freeze them. They freeze beautifully. That is what we must do here, in the True North Strong and Free: preserve. I usually make an Eastern pepper salad with garlic emulsified in salt, (but good) generic balsamic vinegar and gorgeous olive oil. To Die For. Valerie you’re a mine of ideas. How lovely to know that some of our good peppers are resting in your fridge for the winter. I have just been writing about preserving the good summer peppers on my latest article on The American in Italia. I am glad you share my opinion!